The apartments can accommodate up to 4 people have a living area with a sofa bed, a flat screen TV, a kitchen (stove, refrigerator, microwave) and a private bathroom with hospitality products. Maximum capacity of 1 cot or an extra bed per apartment . 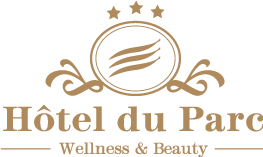 ✓ wellness center with indoor pool, sauna, steam room, salt grotto (Hotel Park) … 15% discount for residents. ✓ Linen and towels available on the day of arrival. Possibility of renewal through 6€/kit. ✓ Breakfast buffet (taken to the hotel of the park) is available and costs € 10 per person (5 € for children under 12 years). ✓ Restaurant “The Alexain” (Park hotel restaurant) 10% discount on the bill (excluding drinks) for residents. ✓ Chamber made on arrival with welcome products in the bathroom. 5€ for children (under 12 years old). The all-you-can-eat breakfast buffet (taken at the park hotel) is available for 10€ per person (5 € for children under 12 years old).